I refashioned the skirt into my size, which was really just one seam on the side plus some cutting the excess bulk in the seam allowance. I love that my new interest in minor tailoring has opened up additional opportunities at the Goodwill 50% Off Saturday sale. Skirt a bit too big? No problem, I’ll fix it! I haven’t branched out beyond simple adjustments yet, although I hope to one day make more impressive refashions like those at Sew I Thought… Some of the Wardrobe Refashion participants produce amazing work, too. July 26, 2010. 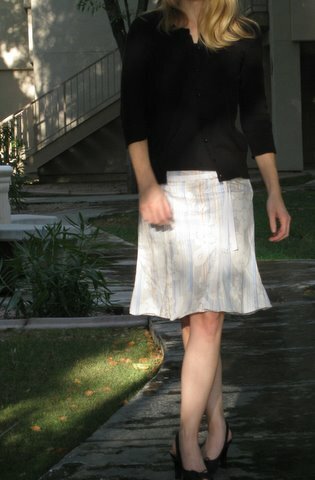 Tags: clothes, Goodwill, refashion, Target, What I Wore to Work Today. Links, Pictures, What I Wore to Work Today, Words. Possibly better uses of your time in MN, but I have a card for a neat used store that is 30 min away, that allows 25% off on Friday and is better than our giant Goodwill for prices and variety. Also here even if hot, you might want light weight long pants against bugs on a woods walk, as a thought. You’re doing great with the recycling. Do you think you, as most, use 20% of your clothes 80% if the time? Or do you you have more variety? July 27, 2010 at 3:43 am. Permalink.